Fendona® is a core weapon in the professional pest control armoury for its rapid and reliable action, broad activity and low risk acceptability. 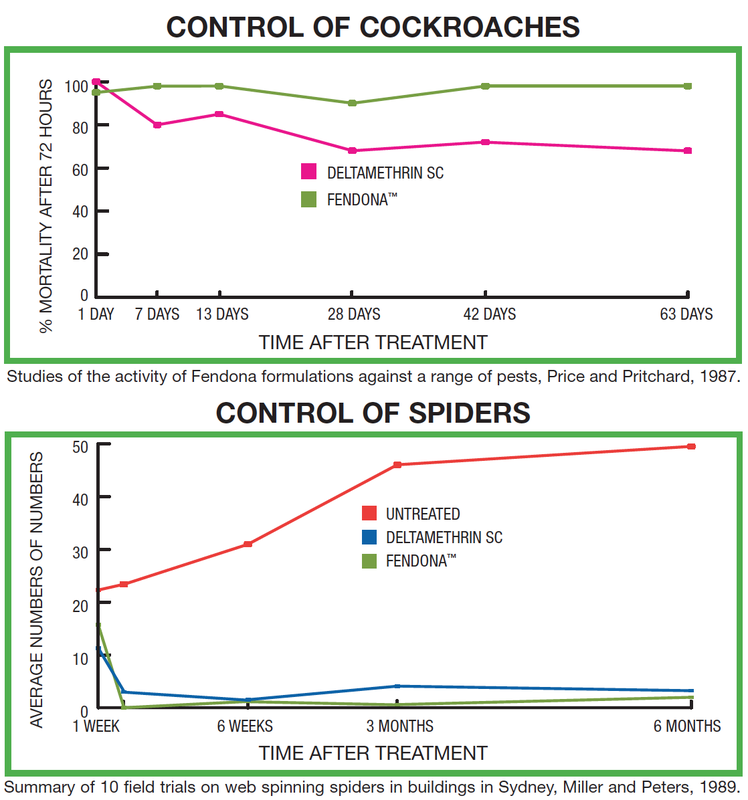 Fendona is active against a wide range of crawling insects by both contact and ingestion for effective control at low dose rates. Fendona stands out from other synthetic pyrethroid sprays for the efficacy and stability of its advanced micro-crystalline particle formulation. Fendona is quick and easy to apply, with an environmental profile that makes it especially suitable for insect control in sensitive locations both, indoors and outdoors. Fendona® Insecticide is a alpha-cypermethrin formulation containing 15g/L of the synthetic pyrethroid active. It is effective against a wide range of problem and nuisance insects in a specialist suspension concentrate formulation. Micro-crystalline particles of active ingredient adhere to many different types of surfaces, including bare and painted wood, glass, brick, concrete and masonry. The advanced formulation further ensures dependable results at exceptionally low doses, for maximum application convenience and minimum total treatment cost. Fendona has earned its insect control reputation by combining speed of action with its reliable residual activity. Its micro-particles cling to the feet and antennae, sensitising insects within the first few minutes of contact. This causes irritation and grooming in an attempt to remove the insecticide, increasing exposure through both contact and ingestion. Excellent bio-absorption of the fat-soluble active leads to knockdown in as little as 30 minutes and death within 24 hours, and in many situations Fendona keeps on working months after treatment. Fendona is easy to dilute and apply through any type of hand operated pneumatic or motorised sprayer equipment and can be used with confidence in combination or rotation with other insecticide classes to combat resistance development. As well as being odourless and non-staining, it has a relatively low toxicity to humans and other domestic animals, making Fendona especially suitable for use in sensitive locations close to people, pets and foodstuffs. Please note however it is toxic to fish, and care should be taken to ensure that the product or prepared spray does not contaminate fish tanks, ponds or waterways. Good biodegradability adds to its superior overall environmental profile. Any residues can be removed from treated surfaces wherever necessary with warm water and normal household cleaners. Fendona is recommended for controlling just about any crawling insect in domestic, industrial and public health applications. In particular, it gives highly effective control of ants, cockroaches, flies, fleas, silverfish and spiders. Fendona is suitable for the control of crawling insects, and flying insects which rest on treated surfaces. When used as directed, it may be safely applied indoors, as well as outdoors on walls, eaves, pergolas, fences, etc. Apply Fendona with a hand operated pneumatic or motorised sprayer at low pressure, not above 30 psi (2 Bar), and with a nozzle that produces evenly sized droplets. Shake the container before measuring the required volume of concentrate and adding to the water in the spray tank. Critical comments: For crawling insects, apply as a coarse low pressure spray to areas where pests frequent. For flying insects, apply as a surface treatment using a fine spray to wet the surface. Apply 5L of diluted spraymix per 100 square metres. If a different water rate is required, adjust the dilution rate to ensure that 2mL of Fendona is applied per square metre for initial treatments, extended control of heavy infestations; and that 1 mL of Fendona is applied per square metre for maintenance treatments, short term control or light infestations. Add a non-ionic surfactant at the registered label rates to improve spreading on hard to wet surfaces. Fendona 15 SC is NOT to be used to control fleas on animals. Use the higher rate for ant control where population numbers are high.